At JGI, we work to protect animals, people, and the environment because we know they are all connected. We have shown that by developing the communities around Gombe and improving their environment, we can also help the chimpanzees living there. In order to understand how these things are interconnected, let’s first discuss the threats that chimpanzees face in Gombe and all over Africa. It is difficult to estimate the number of chimpanzees in the wild because they are so mobile, but we can say that the number has dropped dramatically since Jane first started her work. There may be only as few as 150,000 left. In Tanzania, there may only be 1,000-2,000 (wwf.panda.org). And in Gombe, the situation is dire. 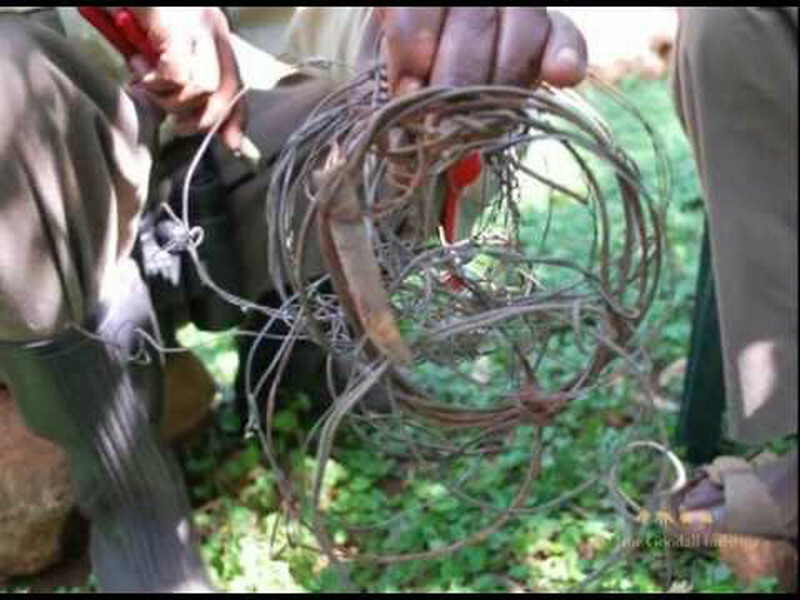 Illegal wire and metal snares are set to catch wild pigs and other animals, but unfortunately, many chimps get caught in them instead. In an effort to get out of the snare, most chimps struggle and injure themselves further. In Uganda, 1 in 4 chimps is either injured or killed by a snare (www.janegoodall.org). Some chimps are intentionally captured and killed for bush meat. JGI is currently working on removing the snares and helping chimps that have been injured by them. Mugu Moja, a chimpanzee in Uganda, was rehabilitated by local volunteers after her leg was crushed by a jaw trap. Mugu Moja’s leg had to be amputated, but thankfully, she learned how to navigate the forest with one leg almost immediately. Click here to watch Mugu Moja’s story. Although the snares aren’t intended to capture chimpanzees, chimps are the targets of a different kind of predation: illegal trade for zoos or for sale as exotic pets. 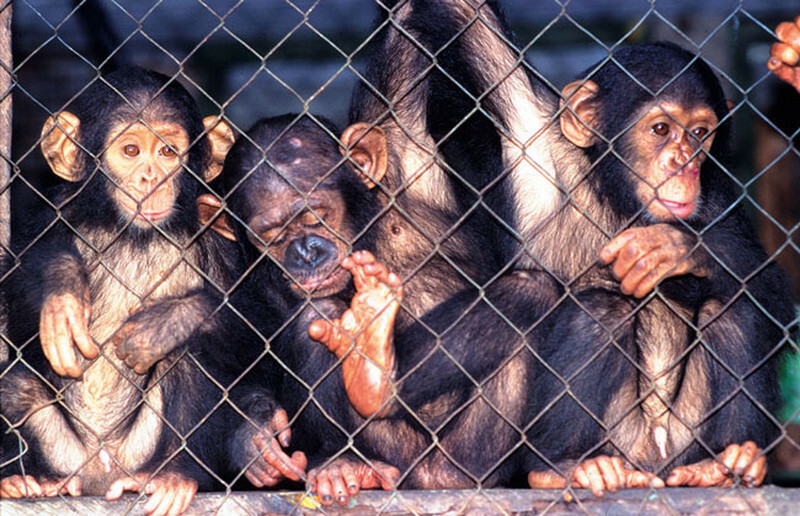 One report documented over 600 chimpanzees being illegally exported from Africa in the past seven years (www.thedodo.com). China is currently the largest market for the chimpanzee trade, keeping them in poor conditions in zoos and as entertainment. Some are also exported as bush meat. At JGI’s Tchimpounga Rehabilitation Center in Congo-Brazzaville, victims of the illegal chimpanzee trade are being cared for until they can be reintegrated into their habitat. Because we are so genetically similar to chimpanzees, they are often affected by the same viruses that we are. These viruses can easily be passed from species to species. The Ebola virus that is currently devastating human populations in Africa is also affecting the chimpanzee population. Interaction with tourists and loggers can expose chimpanzees to diseases that they cannot fight, like the common cold or the flu. In 1966, Jane recorded a polio outbreak within a chimpanzee community, which killed and paralyzed many infants and adults. There is also new evidence that SIV, previously thought to be benign in chimps, actually affects their reproduction rates and the health of their babies. There is also always the danger that a chimp with SIV could pass on the virus to a human. Lemba, a chimpanzee being rehabilitated at the Tchimpounga Chimpanzee Rehabilitation Center, lost the use of her legs from polio. Thankfully, she’s doing well, and is being trained to be a surrogate mother for infant chimps at Tchimpounga! In Africa, the population is growing faster than on any other continent. Most countries in Africa are expected to triple in population by 2100, which would cause Africa to contain ¾ of the world’s population (worldpopulationreview.com). In order to sustain these large populations, much of the land is stripped for housing and land use. Many farmers use agriculture techniques that purge the soil of nutrients and render it unusable. The forest is also targeted for sale to timber, mining, and oil companies. Because the cohesion of chimpanzee communities is largely based on their territorial bounds, groups are often split or displaced by the removal of habitat. Attempting to move between pockets of forest exposes chimpanzees to predation. 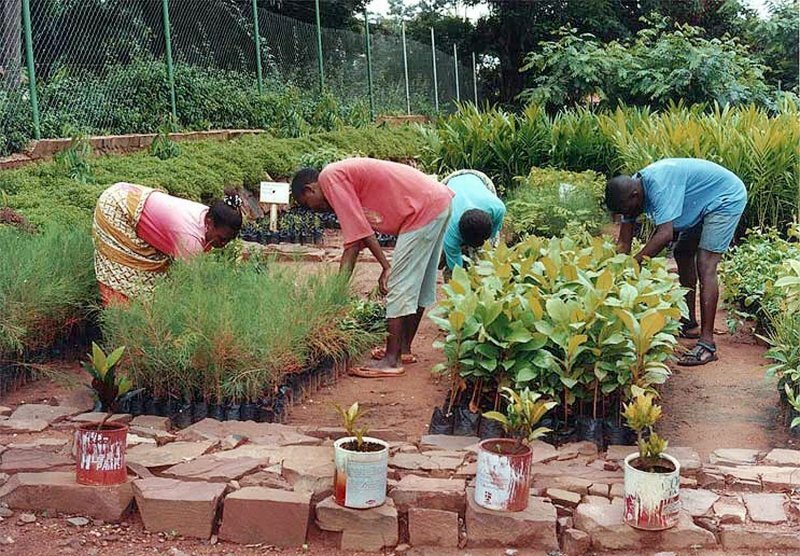 Currently, JGI is working to teach sustainable agriculture methods to local farmers and reforestation techniques to the community at large. Coltan mining is an example of a practice that indirectly affects the chimpanzees’ survival. The metal coltan is used in many electronic devices, including laptops and cell phones. In the Democratic Republic of the Congo, rebel groups have attempted to control and illegally tax the mining of coltan, which has created a lot of violence in the region. This has consequences for the chimpanzee population as well as the human population. The clearing of forest for mining roads and camps destroys the chimps’ habitat. The miners also detract resources from the forests, and sometimes even kill the chimpanzees for bush meat. In 2014, JGI Belgium collected 14,000 kilos of cell phones, computers, and other electronic devices to recycle so that mining decreases. Watch this video to hear Jane talk about the threats chimps face due to coltan mining. Do you have an old cell phone or another electronic device? Click here to contribute to JGI Belgium’s e-waste recycling campaign!